By mid to late January, I am tired of cold and wet (and sometimes dark) days. In a break from our goal to make products in season, I make lemon honey jelly. Honey is the only sweetener and no sugar is added. Best on buttered biscuit and good on most bread (cornbread, muffins, sandwiches, etc.). If you leave out the pectin, this recipe makes a natural syrup for sweetening drinks (like tea), or drizzling over oatmeal or vanilla bean ice cream. Oven bake chicken using just about any dry rub. Finish off on the grill for five minutes after you remove from oven and brush the jelly or syrup on. Clean and zest lemons. This number of lemons will make more than a tablespoon of zest, so if you make more than a tablespoon have a storage plan (dry it or freeze it). Squeeze lemons for juice. Squeeze through rough mesh to keep out seed and rind. It is ok to have a little pulp and the juice does not need to clear. 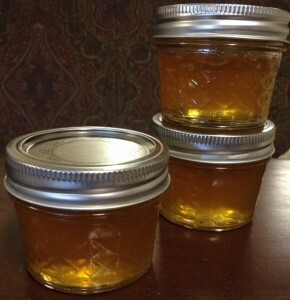 In a larger than four quart, combine the lemon juice, lemon zest, honey, and pectin, and stir well. Once the mixture reaches a rolling boil, stir for four minutes while you constantly stir. After sealed, place in a canner and boil for six minutes (don’t start the clock until the boil starts). Pull from canner and rack until cool.